Is Your Printer Compatible With Lion? If you are installing a brand-new printer, your first step should be to follow the instructions included in the box. Typically those instructions will call for installing software and making connections in a specific sequence; doing otherwise can result in an incomplete or failed installation. Before you begin the actual procedure, check the printer manufacturer’s support site for the latest driver for your printer. Although the driver on the included disc will work, the printer maker likely issued an update or two since the disc was created. If you download a new driver, use it instead of the disc. If you don’t have any setup instructions or installation discs, you should still search your printer manufacturer’s support site for drivers and an electronic version of the setup guide. If you can’t find any drivers or instructions, and your printer connects via USB, simply plug the printer into your computer and allow either Windows or OS X to attempt to install a set of basic drivers. Keep in mind that these basic drivers usually don’t unlock all the capabilities of a given printer model; you’ll likely need to install drivers from the printer manufacturer to obtain full functionality. If your printer doesn’t connect via USB, and you don’t have setup instructions or drivers, follow these steps. 1. Turn off the PC and connect the printer. Power on both the PC and the printer. 2. In Windows 7, click Start, Devices and Printers. In Vista, click Start, Control Panel, Hardware and Sound, Printers. 3. Click Add a printer. 4. 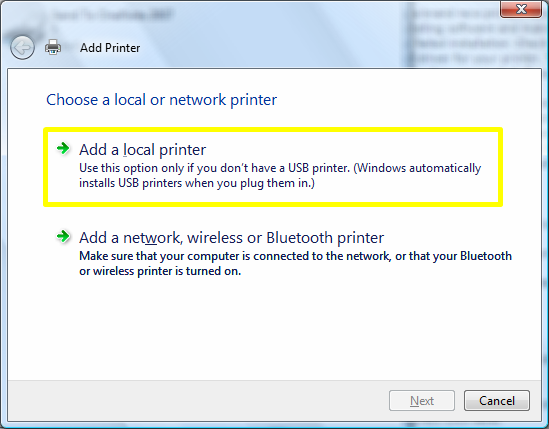 If the printer is physically connected to the PC, click Add a local printer. If the printer is connected wirelessly or over a network, skip to Step 5. 4a. Select Use an existing port, and then choose your printer port from the drop-down list. The default LPT1 selection is highly likely to be correct. Click Next. 4b. Select your printer manufacturer and model from the two lists. If your model is not listed and your system is connected to the Internet, click the Windows Update button. If you have a driver on a disk or CD, or if you downloaded a file, click Have Disk... to point Windows to the driver you want to use. Click Next. 4c. 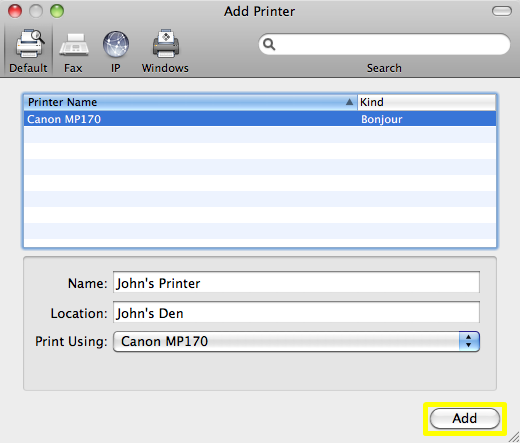 Assign a custom name to your printer, if you want an easy way to identify it. Click Next. 4d. If prompted, select a sharing option. If you are unsure what to do, select Do not share this printer. Click Next. 4e. 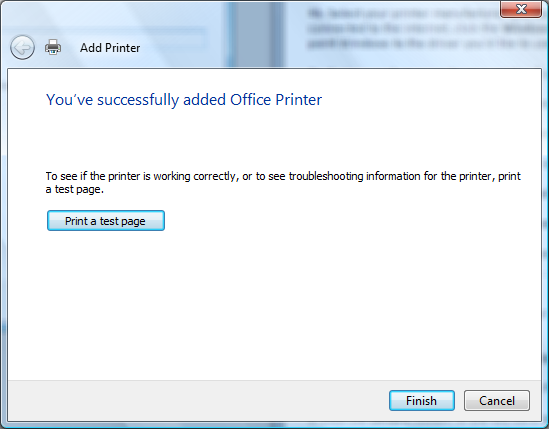 Click Print a test page to confirm a successful installation. Click Finish. 5. If your printer is connected wirelessly or over a network, click Add a network, wireless or Bluetooth printer. 5a. Select the printer you would like to install from the list. Click Next. 5b. If prompted, click Install driver. Click Next. 5c. Click Print a test page to confirm a successful installation. Click Finish. If OS X doesn’t automatically recognize your printer, and you don’t have setup instructions or drivers, follow these steps. 1. 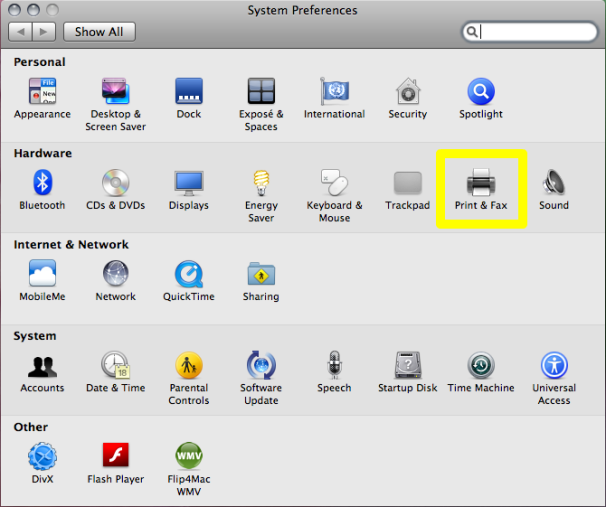 Open System Preferences, and then open Print & Fax. 2. Click + (the plus sign) at the bottom of the Printers pane to add a printer. 3. Click the Default button. OS X will display a list of all available printers, both wired and wireless. 4. Select the printer you want to install. Click Add. 1. In Windows 7, click Start, Devices and Printers. In Vista, click Start, Control Panel, Hardware and Sound, Printers. 2. Right-click the printer you wish to remove. In Windows 7, click Remove device. In Vista, click Delete. 2. Select the printer you want to remove from the Printers pane, and then click - (the minus sign). 3. Confirm that you want to remove the printer by clicking Delete Printer.